Worried about the Summer Season? Not anymore. Stay cool throughout with this V-Guard offering. Beat the summer heat with the V-Guard Enviro Pedestal Fan. This powerful fan will keep you cool throughout the summer season. Available in a striking combination of Blue White and Maroon White, its attractive looks and slim shape are sure to blend well with the interiors of your office or home. Its compact size and light weight allow you to comfortably move and place it around the house as per your convenience. For optimum performance, this Pedestal Fan requires an optimum operating voltage and consumes 55 W of power. Its elegant design with a 120 spoke grill guard is sure to suit your tastes. It comes with India’s first brushless DC motor to use energy efficiently. 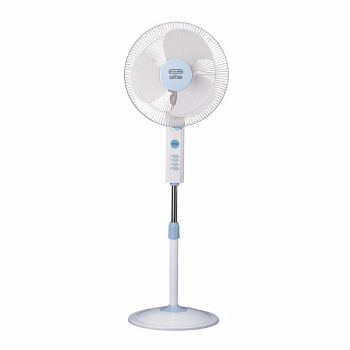 This portable Pedestal Fan does not disturb your sleep, thanks to its ultra silent working mechanism. It’s having a wider oscillation, so that it covers a wider area and cools the entire room. You can easily control this V-Guard Pedestal Fan and enjoy uninterrupted, peaceful sleep during summer. Once you buy this, you will not regret your decision.